Over the last decade, poverty has declined substantially in India, driven largely by the country’s more recent rapid economic growth. Sadly, however, improvements in the nutritional status, particularly of children, have not kept pace. This new research study by the National Council of Applied Economic Research, done for India’s NITI Aayog, seeks to understand why. 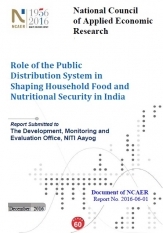 For this important study, the NCAER research team has used its own data from India’s only national longitudinal household panel data set, the India Human Development Survey (IHDS). Using powerful quantitative and analytical tools deployed by economists, demographers, and other social scientists, IHDS data can help evaluate the impacts of public programmes such as the PDS.